CREDITS: Corporate Events, 5-Star Mexican Resorts, Concert Openings, Your Event. Tom's show has opened concerts for Rodney Atkins, America, Chubby Checker, the Drifters and other legends of Rock n' Roll. He has entertained internationally at five star resorts. Tom can often be seen making audiences laugh at shows for corporations, associations, civic groups, county fairs, performing arts centers, colleges, resorts and other diverse venues. but it was Ventriloquist Tom Crowl who stole the show..."
Corporate Comedy That Involves Your Audience! Tom works with you to create a program of dynamic interactions that maximize the audience's experience. You no longer need to worry that the entertainment won't be right. 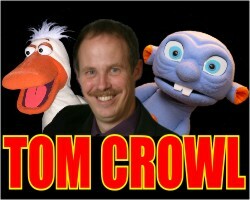 Tom's show evolves into a personalized program that will grab your group and leave them laughing! The goal is to make your people the stars of the event. When Tom's puppets start recognizing audience members, the comedy takes on a whole new level. He will even turn two volunteers into Human Puppets, guaranteed to leave your audience laughing! Wendy M., Keystone Asset Management, PA.
"He entertained an audience of 750 and kept everyone laughing..."
Kathy C., Swire Distributing, UT. "...the human puppet show was awesome." Shawn T., Rada Manufacturing, IA. 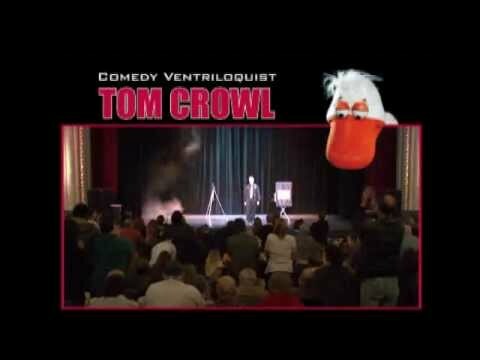 "He was so entertaining, my employees are still stopping by my office today, the Monday after our Saturday event and telling me how great the entertainer "Tom Crowl" was. Thanks again Tom." Karen F., Jerr-Dan Corporation, PA.
"From top management down it has been said this is one of the best Christmas parties that we've had. Don't hesitate to hire this man!! Thank you, thank you Tom for the wonderful time!!" Shanna B., Oxy Permian, TX. leave nothing to chance. Contact Tom to create laughs and great memories!